I’ve been keeping my copy of Laura Dodsworth’s Bare Reality on the coffee table, just to amuse myself really. It’s a big book with a lot of naked-chested women on the front, and I have had different reactions from various visitors. If they are curious enough to open it, most people are quickly absorbed into the stories of the 100 women who talk candidly to Laura about their breasts. Just as breasts come in all shapes and sizes, so do our feelings and stories about them. 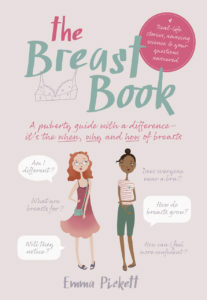 Bare Reality includes a lot of thoughts on breastfeeding, sexuality, and feminism; and a good mixture of people who like their breasts and people who do not. The headless photographs force the reader to see only the breasts, but the accompanying narrative tells a much bigger story, challenging the contradictory social norms of beauty and prohibition. Bare Reality shows you 100 perfect, beautiful women and gives a completely unique insight into their perspectives. Bare Reality is currently available for £20 from Pinter & Martin.